With styles like slate, wood, and tile, and a full array of colors including a Cool Color selection, METALWORKS® Steel Shingles are the ideal choice for a wide range of residential and commercial applications. Featuring a four-way locking system for enhanced performance, METALWORKS Shingles provide an unsurpassed combination of aesthetics and performance. 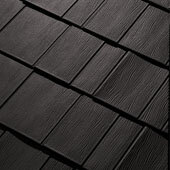 MetalWorks AstonWood Steel shingles provide the traditional look or real wood shingles with a modern twist. They are incredibly durable to help assure years of lasting beauty. The shingles are designed with a four-way locking system that stays weathertight on the roof and are offered with a 50-year limited warranty for added peace of mind. MetalWorks is also available in a variety of Cool Colors. 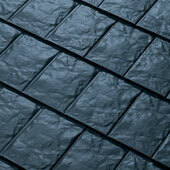 StoneCrest Slate Steel Shingles create a dramatic look that closely replicates the random finish of natural slate. They’re made with a heavier-gauge steel and double stamped for stunning beauty and durability. The shingles are designed with a four-way locking system that stays weathertight on the roof and are offered with a 50-year limited warranty for added peace of mind. MetalWorks is also available in a variety of Cool Colors. 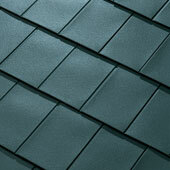 StoneCrest Tile Steel Shingles create the distinctive look of smooth, uniform tile. 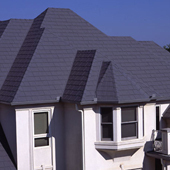 For those who appreciate a contemporary and refined appearance, these shingles provide outstanding performance and value. The shingles are designed with a four-way locking system that stays weathertight on the roof and are offered with a 50-year limited warranty for added peace of mind. MetalWorks is also available in a variety of Cool Colors.